I have a 2 year old who loves bikes. We have an old, rusty bike that has 2 flat tires and training wheels that is for a 5 year old. She tries to ride it every time we’re outside. Her little feet can’t even reach the pedals. Guess what that results in? Me pushing her on the bike. I had to find a bike that she could ride herself. I really wanted a balance bike / pushbike for her. Mainly because I wanted her to do it on her own. 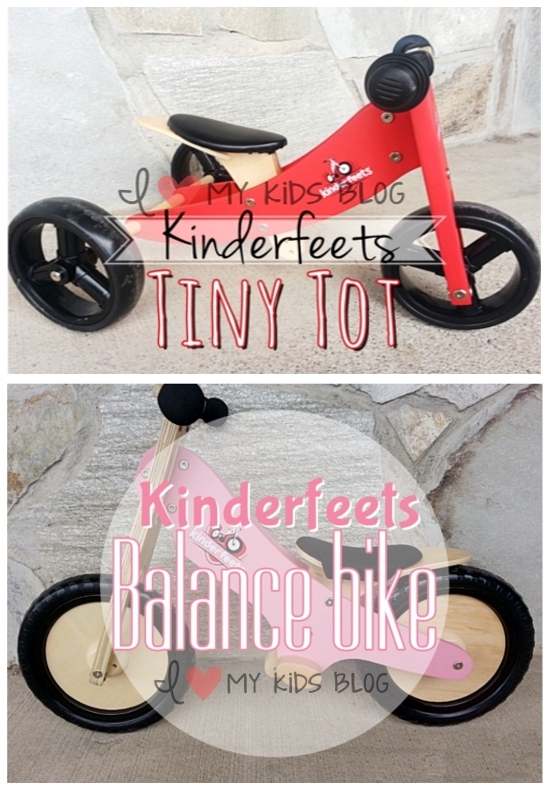 I found out about Kinderfeet’s pushbike and Tiny Tot. I was interested in the Pushbike but I was able to also try out the Tiny Tot as well. One thing that really made me want Kinderfeets bikes was the chalkboard paint finish. 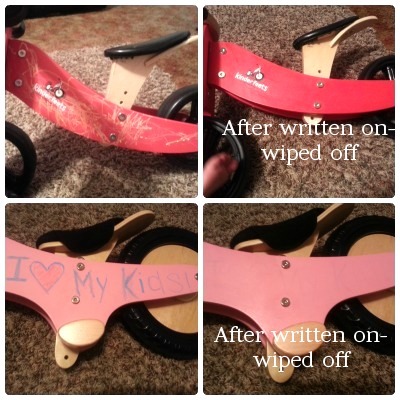 The bike is wooden and can be written on with chalk. If you purchase the push bike, you get a 12 pack of colored chalk. If you buy the Tiny Tot bike you are not provided with chalk. If your child colors lightly on it and doesn’t push hard the chalk should wipe off easily as pictured below. This was a huge hit for my 2 year old daughter. As I said before, I got the Pushbike and the Tiny Tot. The Pushbike is for recommended for children ages 2-5, while the Tiny Tot is for 1-2 year olds. 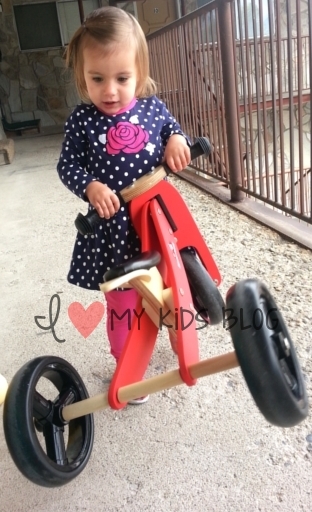 Below, I have added a picture of my 2 year old daughter next to both the pushbike and tiny tot. I am going to explain the difference between the 2 bikes as well as talk about the awesome features they both have! Assembly is fairly easy for both bikes. But does require a few minutes (especially if you’re me!) Both bikes come with all the tools/screws needed to set up. The Pushbike was a little easier to set up because it only had 2 wheels. So it just takes a little less time. Below is the Pushbike halfway done. It only took my husband 4 minutes to set up. The Tiny Tot is the one I set up. It took me literally 20 minutes. The directions were spot on, but I am just super slow at assembly. I didn’t get any pictures of the assembly because I was pretty frustrated. But I did finish the assembly by which I was really proud of. One feature the Tiny Tot has that the Pushbike doesn’t is that it can go from 3 wheels to 2 wheels. This was great for my daughter because at first she was really skeptical with the Pushbike, and was afraid she couldn’t ride it. She only started riding the Tiny Tot with 3 wheels because it was easier. We took the 3rd wheel off the Tiny-Tot and it was only a 2 wheeled bike. She didn’t ride either bikes for a couple of days then one day she tried the Tiny-Tot and it was too small for her. She then grabbed her bigger Pushbike and was riding it like a champ! I was amazed. The seat has an adjustable height for both of the bikes. It can be moved up and down to fit the right height for your child. The seat on the push bike has velcro strips so it can be removed. The seat is also padded for comfort. The tiny-tot bike does not have velcro strips. It has a leather-like fabric. The pushbike and Tiny Tot both have great handle bars but they are slightly different from one another. The push bike handle bars are soft and squishy. 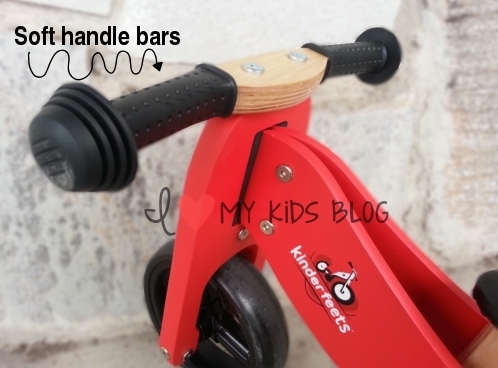 The Tiny-Tot handle bars are more of a rubber material. The bikes are very light weight. My 2 year old was able to carry the Tiny-Tot very easily. The Push bike and Tiny Tot are both amazing bikes for children. The bikes teach them to how to maintain balance. One last thing about Kinderfeets Tiny-Tot and Push bike is the tires. The tires are made of rubber and can NOT go flat. Which is great for little kids! 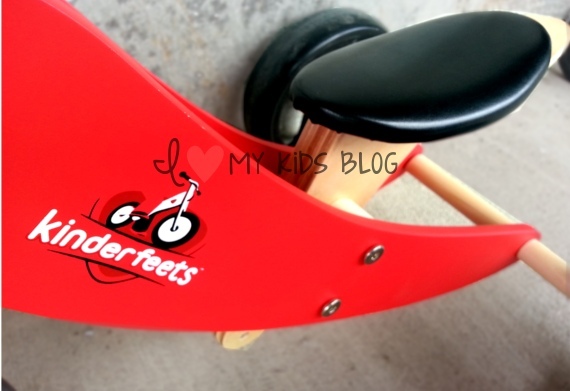 I will recommend Kinderfeets as a great company for starter bikes for babies and toddlers. 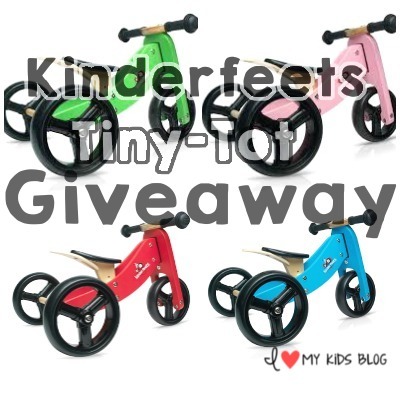 Kinderfeets has offered to giveaway one (1) Tiny-Tot bike to one luck I Love My Kids reader! Giveaway is open to U.S. only and ends @ 11:59 on October 16, 2014. « The Beatrix Girls Dolls are the new cool toy you’ve got to see! Message says it did not receive my comment, please try again. Can’t enter. My son would like it a lot! My kids would love this its great! I would love to win this for my son! Thank you for the chance! I would like it for my son. I like that is can go from 3 wheels to two wheels so easily. I like the fact that the tires never need air! I would love to win this for my son, seems so much easier than old scool bikes. WOULD LOVE TO WIN THIS FOR MY NEPHEWS! I would love the dutch orange chalkboard bike for my son! My favorite feature is that the wheels can not go flat. How awesome, I love the way it converts to abdapt to childs skill level. My grandson would love it. have 3 great grandsons that will have to learn to share this when they visit !! I want to win because my little one loves anything with wheels, and he would love to be able to get moving on his own. I love that is goes fron 3 to 2 wheels so easily. I’d love to win this! I’ve heard such good things about balance bikes and know my daughter would get a kick out of it. I love that it is so small! My daughter is small, and everything else ends up being too big for her. Plus the are so cute! Thank you for the wonderful giveaway. I think the chalkboard paint finish is brilliant because kids just want to decorate and re-decorate everything! I would love to win this for my little boy. One of the features I like is that the tires are made of rubber and won’t go flat. My granddaughter just turned 1, and this would be so great for her! I like that it goes from a three wheeler to a two wheeler, grows with the child. 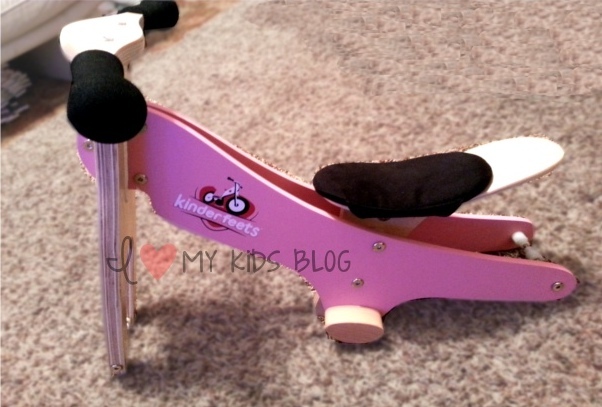 I love how sturdy and yet light weight this is compared to most trikes! I love that it can be used with 2 or 3 wheels. I love that the tires cannot go flat. There would be no disappointment that happens with other little bikes. Would love to win one for my nephew! i love the look of the bike. Reminds me of the classic toys that I enjoyed as a child. It would be a great gift for my nephew. Reminds me of the classic toys that I enjoyed as a child. It would be a great gift for my nephew. I would love to win this for my daughter, and I love that you can color on it and wipe it off. What a creative idea. I like the fact that the tires don’t go flat! Thank you! For my daughter.. She would love it!! I would lov to win for my godson and his cousin ,I watch both of them weekdays ,they would love it!! I would love to win for my godson and his cousin ,I watch both of them weekdays ,they would love it!! I love the chalkboard finish! My daughter would love this! I love the chalkboard finish! My daughter would love this! Thank you so much for this chance! I would love win this for my 18 month old and it can them be passed down to her sister that we are expecting inn January! I would love win this for my 18 month old and it can them be passed down to her sister that we are expecting in January! I love everything about it! This would be perfect for both my boys and daughter! I love how this is perfect for toddlers. It is the perfect size so that us parents do need to run around pushing them, especially good for those of us with bad backs. Love how the push bike teaches balance without training wheels. What a great bike! My 2yo would love this! I love how perfect this is to teach little ones how to bike. These look like a lot of fun. What a great bike! My 2 year old would love this! 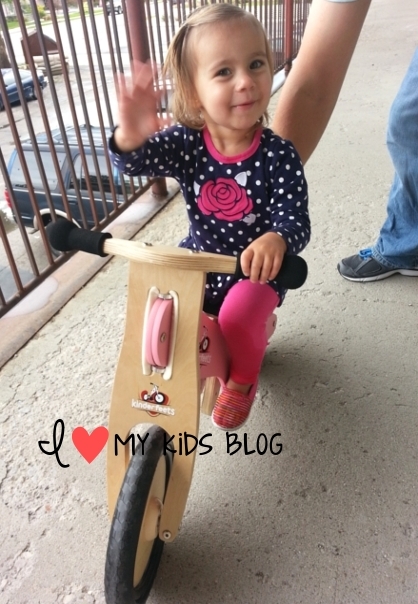 The balance bike is such a great tool to learn to ride without training wheels too. 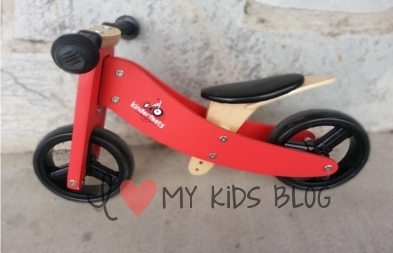 I have wanted a balance bike for my son for a while! they say they are better for children learnng to ride a bike. Love the soft handlebars! Would love to win one for my boys – they would really enjoy it! I like that it transitions from 3 wheels to 2.
i love how light weight it is. I have a little guy who wants to do everything on his own but most things are too heavy. I love how light weight it is. Perfect for those little independent toddlers. I’ve always wanted one for my kids! i love it that the tires won’t pop and I’ve always wanted one for my kids! I love the design. 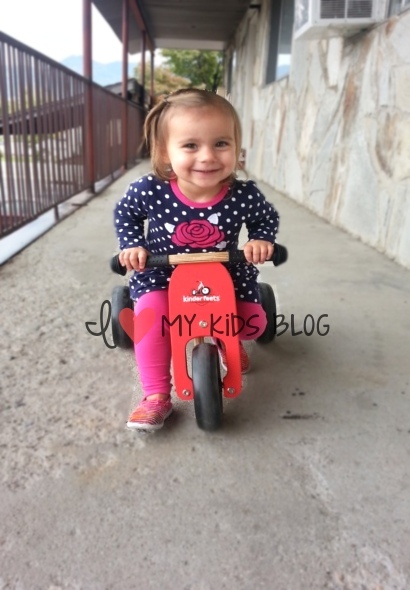 This little trike is perfect for my granddaughter. we are having trouble teaching our preschooler to pedal. This would be perfect to help her. We are having trouble teaching our preschooler to pedal. This would be perfect for her. Love how it’s adjustable and the tires are biodegradable. My son would love this! My sons would love this! He is always asking for a bike. My son would love this! He is always asking for a bike. And this would be a perfect starter bike. i love that this is a push bike and can be adapted to the child’s developmental level! I like the fact that it teaches balance. Also, that the tires will not go flat. I love that it converts to a two wheeler balance bike. I love that younger kids can learn to ride a bike. And it is super cute! I love that younger kids can learn to ride a bike. And it is super cute! I think my daughter would love to have this terrific bike. I love how it converts! What a brilliant idea! Wow! The tires won’t go flat. I really like that because we have Osage orange trees with serious thorns that puncture tires easily. I like that it’s wooden. SO adorable! I like that the bike is easy for little ones as my son doesn’t use peddles and they get in the way. This would be perfect! Would love to teach my two year old to ride! Would love to teach my two year old to ride! Like that it’s wood not metal. I want to win this for my 1 year old. I had no idea she could ride a bike already. I love that you can write on it & wipe it off! I love that you can write on it & wipe it off! & also the handlebars are soft is nice too. I love that it is a training bike! I want to win this because my precious granddaughter loves to go, go, go and I think that this would help her get where she wants to go. She is a mover!! I love that these bikes are made from wood and love even more that the tires are not filled with air! We’ve had to replace bike tires twice in the past year on my older kids’ bikes. Insane. If we win I would get the Dutch Orange Chalkboard bike and save it for my sons birthday! Seems like it could be a great confidence booster for the young rider just learning – and confidence is the biggest part of being able to ride a bike. I love that this bike is designed to install that in a very young rider! What a thorough review! Definitely looking into this for Christmas! !